Mirror Man: My queen, you have defied nature and robbed it of its fairest root. But on this day there is one more beautiful than you. Queen Ravenna: Who is it? Given the visual wonderment seen throughout this darker take on the Snow White fairy tale, it is too bad there is not more to praise in other regards. 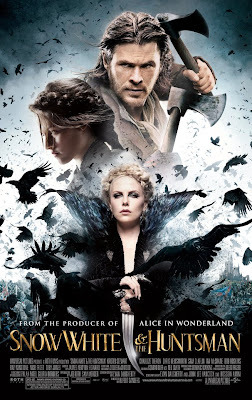 Snow White and the Huntsman is a fairly empty film that has plenty to show off on the outside, given the high budget and imaginations at work to create rich fantasy worlds, but practically nothing inside when it comes to showing off the characters involved or a story that makes more sense. 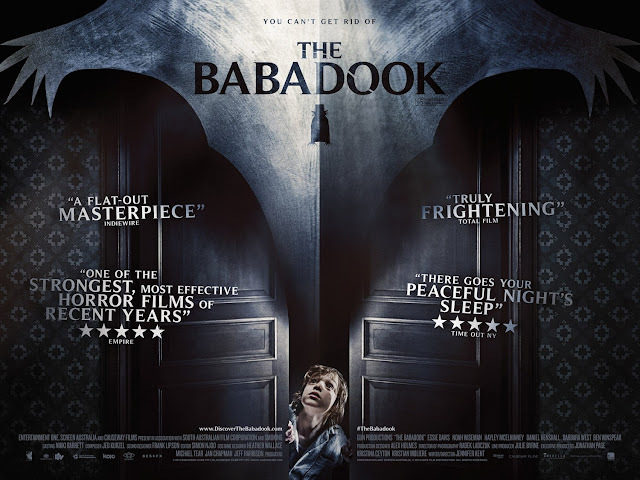 This would be less bothersome if the film was at least fun, but it has very little joy to share, instead keeping things quite grim throughout. Despite good looking visuals and a good looking cast (in more ways than one), Snow White is more or less a bad apple. The story begins with young Snow White’s new stepmother ruining things for everyone. Snow White’s father, the King, gets over grieving for his deceased wife, after a battle with the Dark Army leads to him rescuing the beautiful Ravenna (Charlize Theron). The two quickly get married, but Ravenna just as quickly reveals that she is a powerful sorceress and the true master of the Dark Army. After taking the life of the King, Ravenna manages to take control of the kingdom, with only a handful of the King’s knights managing to escape. In an effort to maintain her beauty and with the aid of her magic mirror, Ravenna spends much of her time draining the youth out of women who could possibly rival her beauty. Additionally, Ravenna locks Snow White up in the highest tower of the castle. Many years later, the Evil Queen’s magic mirror informs her that a now-grown up Snow White (Kristen Stewart) is not only the fairest of them all, but capable of destroying Ravenna altogether. Ravenna sends to have Snow White killed, but she manages to escape into the Dark Forest. 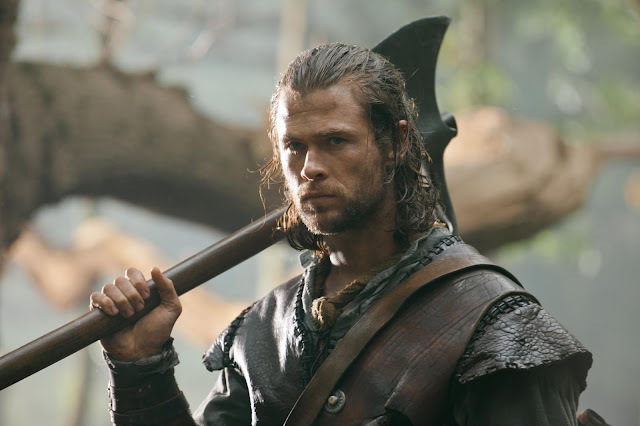 With few options, Ravenna then enlists a Huntsman (Chris Hemsworth) to aid in finding Snow White, as he is one of the few known to have survived a trek through the Dark Forest. In doing so, however, the Huntsman finds himself reconsidering bringing Snow White back and instead helps her flee farther away from the Queen’s land. As the two journey towards the rival armies that could possibly make a difference in ending the Queen’s rule, they encounter a variety of creatures and characters that make everything all the more fantastical, despite remaining mostly sour-faced throughout. The clearest problem this film has is its inability to make what should seem fascinating and exciting in anyway engaging. There are moments here and there that work on certain levels. The climactic battle at least establishes an objective worth holding interest in and the initial entrance into some of the various new lands are visually pleasing, but so much of the film feels bland, despite showing off so many eye-popping flourishes. I can assign much of the blame to the story, which provides little to invest in and is not aided by investing in its darker tone. There was a level of intrigue created by setting the Snow White story in a darker world with seemingly more at stake, given the brewing war between a Queen and her people, but the film does little with this universe, besides show off the creatures living in it. Another issue is the lead character. Who is Snow White? The film did not really provide me with any answers to that question. Here is a girl who spent the majority of her life locked away in a tower and, after escaping, spends the majority of the film speaking in sparse moments, before delivering a rousing speech to tell everyone that Evil Queens are bad. Snow White seems to be capable enough in walking around fantasy lands, but we don’t get much else from her, despite being told by others that she is important. This has nothing to do with Kristen Stewart, who is forced to work with what she’s given (although we can all have fun talking about her accent later); it just feels like a character with as much a blank a slate as Alice in Alice in Wonderland. Sure, both get to prove that they can handle themselves in the face of adversity and battle, but there’s nothing really to them, besides knowing they are good people at heart. At least Hemsworth’s character is established as a widower, coping by drinking and pretending to not give a damn. Fortunately Charlize Theron brings a lot to the film. Not only is it enough that she is already beautiful, but the added use of ‘crazy eyes’ certainly makes for a strong portrayal of the Evil Queen. Theron goes to the places needed for this type of role and makes the character fairly enjoyable to watch. 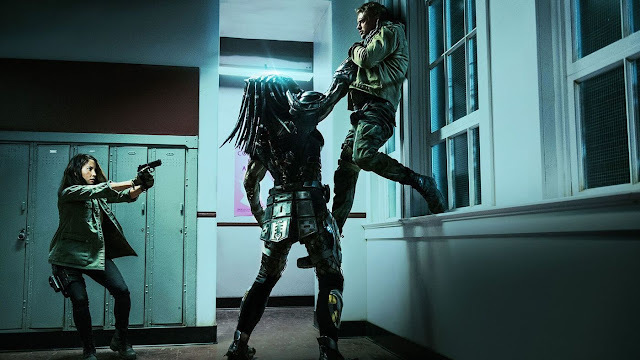 I would give more praise, but once again, the film has such a serious mood throughout that it is hard to really say she goes fittingly over-the-top, as opposed to just acting crazier than everyone else in the film, who have more or less glum attitudes. It also does not help that Theron’s role is way more limited than it ought to have been. Another fortunate bit is the presence of the dwarfs. Combining the great special effects work with a host of talented English actors (including Bob Hoskins, Ian McShane, Ray Winstone, Eddie Marsan, Toby Jones, and Nick Frost), the second these characters entered onto the screen, it was as if life was inserted into the film. In a film that is played so deathly serious, the chance to have a bit of fun was seen whenever these characters were around. Of course, only getting so much of who these little guys are can only take me so far. They mumbled their names now and again and the fact that we started out with eight dwarfs was probably supposed to make me more involved with them, but I wasn’t really, beyond getting the chance to smile because they all did something humorous at some point. There is reason enough to talk about the visual some more, I guess. Making his theatrical film debut, Rupert Sanders has emerged from the realm of TV commercials to direct this incredibly expensive feature and clearly has a keen eye for effective special effects. It is just unfortunate that he has put together such a bland feature. Getting a look at this world is one thing, but not having anything to really do with it is irritating. 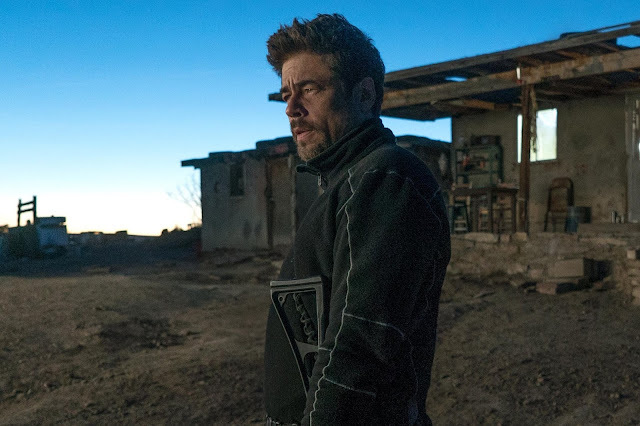 Despite having so many good looking things on screen, the film really slows down for the majority of its runtime, which is never any good when following a lead character with no real personality. 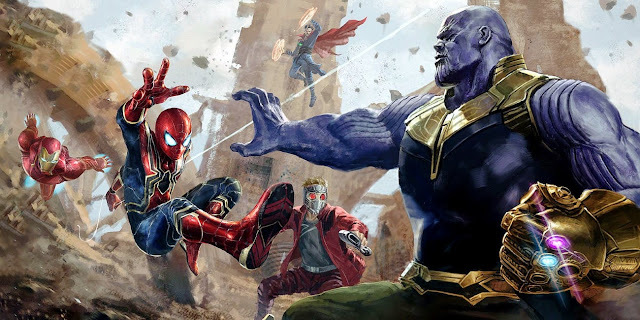 Still, the arrival of various special effects creations and how they manage to interact with live-action characters was impressive in a good majority of the scenes. It is always nice not to be able to see the seams so clearly. The ingredients for a better movie are within Snow White and the Huntsman. However, as it stands, the movie is a visually great, but mostly un-engaging bore that attempts to inject more Lord of the Rings into its Grimm Brothers storytelling, with ineffective results. The lead actors are not really at fault, especially not Theron, who is giving her all, but not Stewart either, who is getting a bad rap as an actress due to being a part of a badly written film series. 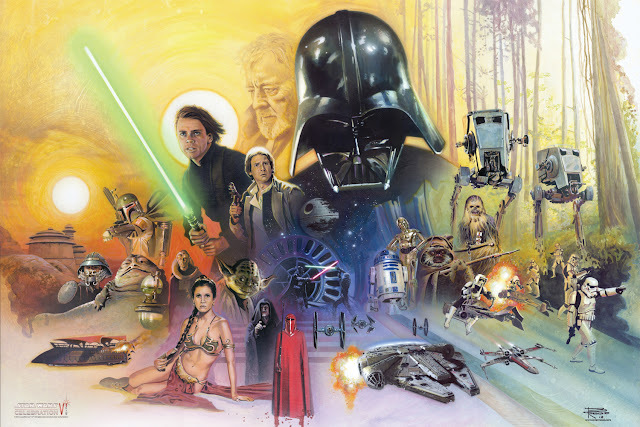 Really, it is the leaky screenplay, which has a lot to play with, but makes all of the uninteresting decisions. The film contains bland characters, a story that meanders for no apparent reason, and striking visuals. With two out of three of these being unfavorable in what should be an exciting, fantasy adventure, there is something wrong with the film. Snow White and the Huntsman clearly proves that it is not the fairest of them all. Snow White: I've seen what she sees. I can kill her. The trailer hooked me for this one, but I guess I should just wait for it to come to DVD. Good review.